Bringing home a new Husky is an exciting time yet the responsibility of training them is huge. In recent years, crate training has taken off as an ideal way to help you train your hound into a well-behaved family pet. Used correctly, it can be a fantastic aid and speed up house training, limit destructiveness and create a little sanctuary your Husky can call home. Crate training involves using a wire or plastic enclosure with a top and door, normally with a plastic covered bottom. All-wire enclosures are popular as they are easy to clean and well ventilated, but predominately plastic crates are used for airplane travel. While either variety can be used, a Siberian Husky with a more nervous disposition (perhaps a rescue pet) may prefer an enclosed crate better. Avoid fabric type ‘crates’ because your Husky will easily chew through them. The crate training itself comprises of getting your Husky used to spending time in his or her crate without getting anxious or upset. There are several aims of using a crate. The main one is that your Husky always has their own place where they feel safe and can go to at any time. When your Husky is a small puppy (admittedly this stage does not last long! ), your house can seem large and daunting. Using a crate provides a safe place for them to go back to that is familiar and secure. It can also help keep your puppy safe if you need to leave them alone for any period of time, before they have learnt what they can and can’t do. Dogs are also den animals, and many adults like using a crate as it helps them feel secure. If you are travelling with your Husky, or staying somewhere new, using a crate can be beneficial as it is an environment they are used to and somewhere they can feel more relaxed. Additionally, using a crate can help alleviate behavioural problems. If your dog is destructive for example, crate training can stop them damaging your home when you go out. However although it can be used as an aid to training, it will not deal with the cause of the original behaviour and this will still need to be addressed. Finally, it is important to remember that the crate should be used as a positive training aid with your dog. Never use the crate as a form of punishment. 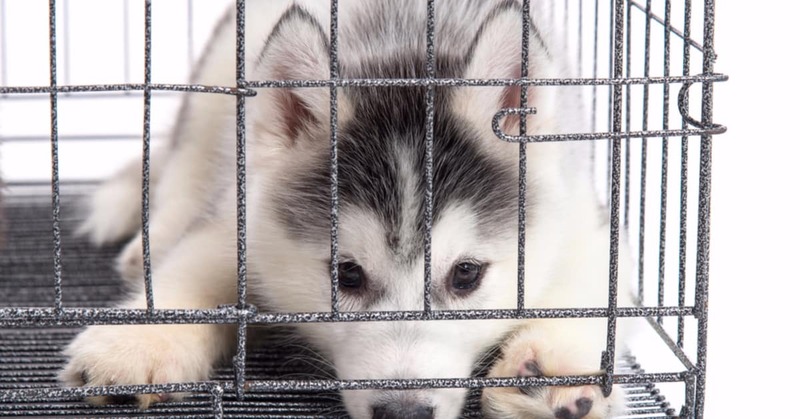 Your Husky should also not be spending the majority of his time each day in his crate. What size crate for your Husky? The crate needs to be large enough so that your adult Husky can stand up, lie down and turn around comfortably. A male husky would need one around 42 x 28 x 30 inches, although a smaller female may get away with one just 36 inches long. A smaller puppy will not need so much room. If you are unable to buy different sized crates, use a partition to create a smaller area. A smaller space will aid house training as your puppy will be less inclined to mess where they sleep. Where to buy a crate? Crates are easily available, and can be bought from any large pet store or online (for example at Amazon.com). As mentioned earlier avoid the fabric constructions. Instead look for an all-wire crate with a plastic bottom that makes for keeping things tidy and easy cleaning. If you are crate training your Husky as a puppy, the key as stated is to make it a nice, safe place for him to want to be. Hopefully your puppy’s breeder will have given you something that smells familiar to them, or take a blanket when you collect them and rub it on their mum before you leave. Place this in their crate with their new bed to make it smell familiar. Inevitably your first night or two will be rather noisy as your puppy misses their litter mates, but after you get through this things should get easier. In the meantime, make the crate positive experience for them as much as you can. Let them have their meals in it, and encourage them to go in occasionally and reward them with treats (without shutting the door at first). Place a new toy in there for them. All in all, make it a place they are happy to be. After a while, during the day you can start shutting them in for short periods too. Ideally, this can be when they are ready for a nap after playing or feeding. Place one or two treats in there, encourage them to sleep and close the door on them. Open it when he has settled. Always let him out when he is being good, and ignore him if he is being noisy. Talking to him or telling him off when he is misbehaving is still providing him with the attention that he is after. You can start to gradually increase the amount of time they are left in, but do not leave your puppy in their crate for long periods of time; they will need to be taken outside regularly to relieve themselves. They should be allowed to sleep in their crate, but remember that as soon as they wake up they will need to be taken outside again. Puppies are like small children, they have little self-control! Never introduce your husky to the crate by putting them in it and just shutting the door for long periods of time, they will find this very distressing. After a time, you will find that your puppy is relaxed and happy to go into their crate when asked. This can be helpful if you need to go out and leave them unsupervised at home. Just remember, no husky puppy, or any dog for that matter, should spend long stretches of the day crated. With adult husky’s crate training can be conducted in much the same way. Place a favourite piece of bedding in there, feed them in it and encourage them to go in for a treat. Again when they are nice and tired, start by shutting them in for short periods. Let them out and reward them when they are calm and quiet. Finally, remember that your husky loves being around their family; they are very much a pack animal. They will be happier using the crate if it is not isolated and out of the way. Keep them nearby to help them relax. You will soon find that they take themselves off to bed when they need a nap! Crate training your husky can help in many ways, and is ideal in providing them with a safe, secure place where they can relax. As long as the crate is never used as a punishment it will be a positive addition to your Husky’s life. Cesar’s Way online dog training courses addresses various behavioral issues that you might be having with your dog. It’s the only dog training course we recommend. Crate training is just one part of an overall training strategy you should have. Also check out our other articles on training which cover a range of topics such as feedback, potty training, leash pulling and more!